I saw this idea at church on the weekend and the jars looked so pretty. I loved the simplicity and thought it would be easy to replicate. No word of a lie, once I had the supplies home this project took me less than 5 minutes to put together. At church they had many of these lining the tables in the lounges. It looks beautiful. I just made one for now, but may end up making more. They would make a cute little gift as well. Here is a shot of the dollar store embellishments I picked up. *I love the dollar store. It’s true, you do get what you pay for and must be mindful that the quality will generally be poor, but it is much like thrift store shopping. You are looking for items with “good bones” or structure. I buy most of my Christmas wrapping paper at the dollar store and often incorporate tacky ornaments and decorations into projects and my gift wrapping. Such was the case with the items I purchased to dress up this jar. It is amazing how you can take something that you might otherwise consider very cheap and unappealing and then configure it into something spectacular! 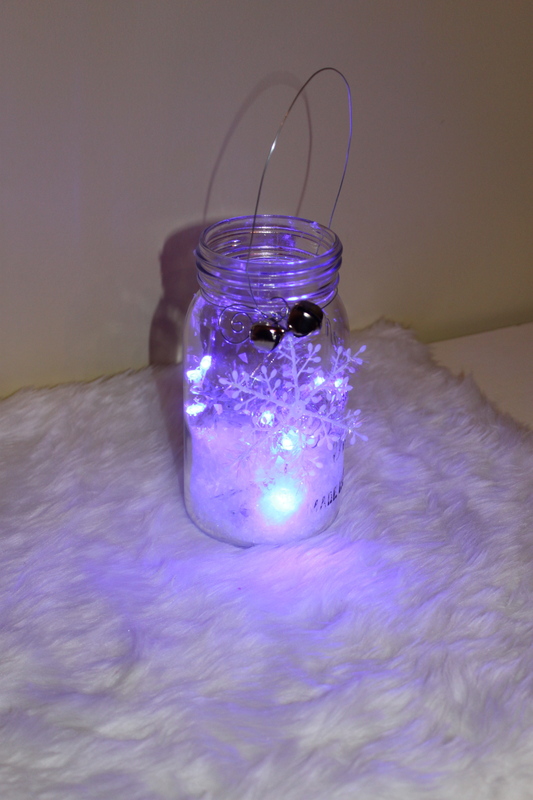 Set the jar on the fur mat and turn on the lights. (This actually takes about a minute because you have to squeeze your hand in the jar to get to the switch). This angle shows you how I used the “s” shaped ornament hook as a feature in the finished project. I love the design of the hook. 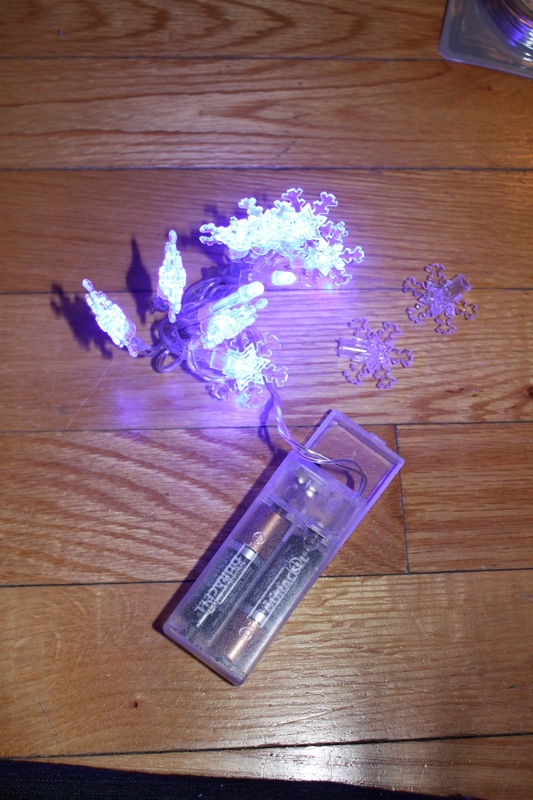 Here are the snowflake lights with two of the snowflakes pulled off. *I found a set of the battery operated mini lights at the dollar store. They were a buck and I knew they were $4 at Canadian Tire, so I felt it was worth the gamble. I didn’t really like the “snowflake” bulbs and wasn’t impressed when they gave off a blue light instead of the soft white I was expecting. However, I easily slid the snowflake portion off the end and the blue didn’t look quite so bad. I may still pick-up a set of white lights. So simple and pretty. 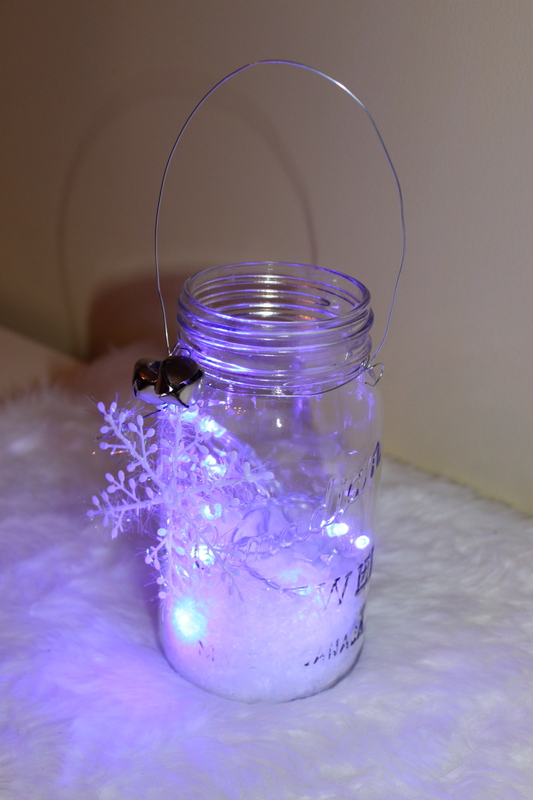 Posted on December 3, 2013 by Cindy Roy •	This entry was posted in All Things Christmas!, DIY and Upcycling and tagged Christmas decor, homemade gift ideas, inexpensive Christmas decor, mason jar with lights, simple and elegant Christmas decor, simple Christmas project. Bookmark the permalink.